Screwball PI Dev Haskell is back in already the 12th book in this popular series. Of course there's a lady getting him in trouble again. When Dev's latest girlfriend is out of town he is asked to watch her dog. Walking with this dog he meets a showdog even as well as its peculiar hippie owner. It turns out this owner is something of a social activist but her involvement with a big amount of weed gets her into a lot of trouble with some dangerous thugs. Haskell tries to help her out, while bedding and offending the ladies, getting into trouble with cops, getting beaten up and sharing some BBQ chips with a dog. There's a lot of laughs in these one, even more than usual in this series I guess. 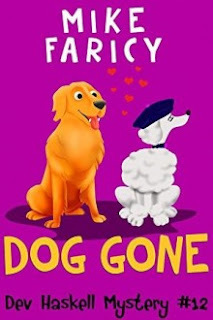 That's what you get when there's a damned funny couple of dogs in a book. Make no mistake though, Dev isn't above getting an AR-15 out of his car's trunk to take on the bad guys!